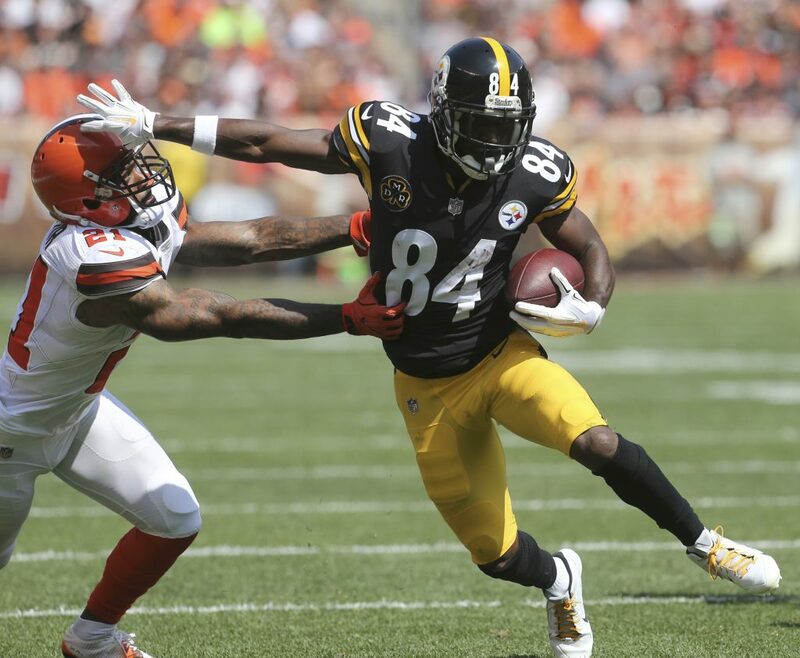 Are Antonio Brown and Julio Jones Hall of Fame calibre wide receivers? The NFL is currently in a golden age in the passing game, with a number of quarterbacks and wide receivers destined for the Hall of Fame. Antonio Brown and Julio Jones have established themselves as the leading wideouts in the league due to their consistent level of incredible production with the Pittsburgh Steelers and the Atlanta Falcons respectively. Both players routinely rack up over 100-catch and 1,000-yard seasons, highlighting their quality and durability. Antonio Brown is currently on the path to reaching the Hall of Fame. Brown and Jones are currently on the path to reach the Hall of Fame, producing performances that put their fellow wideouts in their shadow. However, the question remains where the two players rank in the all-time list at their position? In the history of the NFL there have been some truly standout characters, none more so than Jerry Rice, who is considered not just the greatest receiver of all-time, but as the best player to grace the league. Brown and Jones are fine players, although not quite at the calibre of Rice. However, they could fit into the order in the top ten due to their dominance over the last decade. They could rise further depending on durability, with both players still operating at the peak of their powers as they approach the age of 30. A legacy could be established by maintaining their excellence into their thirties as Rice and Larry Fitzgerald displayed and continue to do so. We’ll now break down the top three wideouts in the history of the NFL and see where in the standings Brown and Jones could place themselves by continuing to produce at their current level. 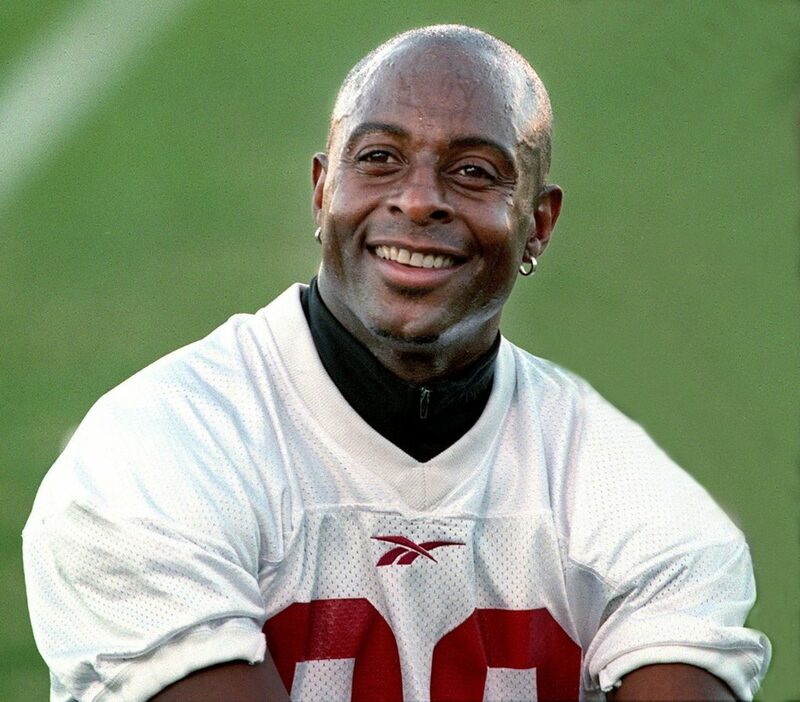 Jerry Rice before practice in Stockton Calif in 1999 with the San Francisco 49ers. Rice’s level of excellence has been unmatched since his retirement in 2004. The wideout was a dominant force in the league for 20 seasons for three NFL teams. His best work came with the San Francisco 49ers where he and Joe Montana carved the league apart. Rice led the league in receiving yards and touchdowns six times in his career, setting the benchmark for receiving touchdowns when he notched 22 in the 1987 campaign. His size and speed made him almost impossible to cover for opposing cornerbacks, while Rice’s hands allowed the wideout to pull off incredible catches with regularity. Rice’s ability to put up statistics were aided by the quality of the quarterbacks he played alongside during his career – Montana and Steve Young at the San Francisco 49ers and Rich Gannon at the Oakland Raiders. Rice was an integral part of the 49ers teams that dominated in the 1980s and 1990s, winning three Super Bowls. His 215-yard outing in Super Bowl 23 guided the 49ers to victory, with Rice winning the MVP honours in the contest. Rice was again influential in Super Bowl 24, notching 148 yards and three touchdowns in San Francisco’s destruction of the Denver Broncos. He was voted to the Pro Bowl 13 times and was named an All-Pro ten times in his career. No player has come close to matching his 22,895 yards, 1,549 receptions and 197 touchdowns over the course of his career. There’s no argument that he’s the greatest of all time. 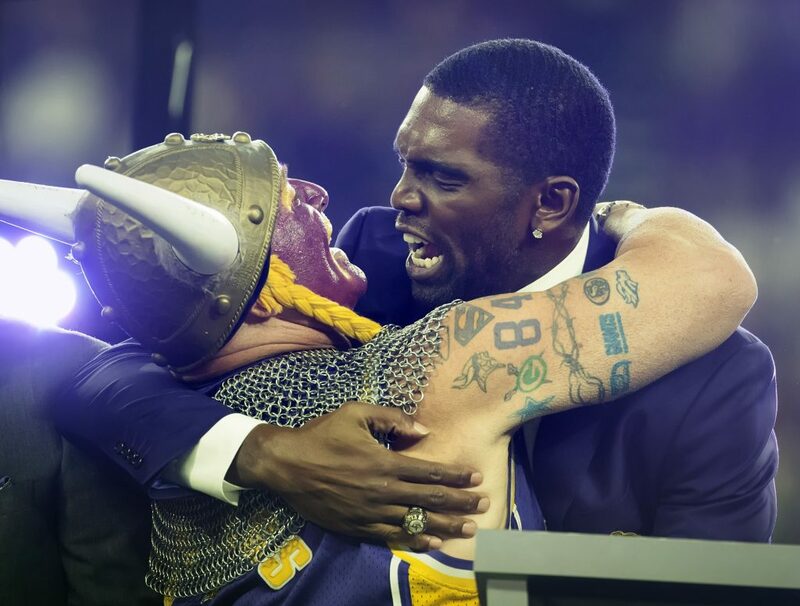 Former Viking Randy Moss hugs superfan Syd Davy. Simply on talent, Moss is equal to Rice – arguably he had greater attributes than the 49ers’ man. However, it did not always translate into production on the field. At his best, Moss was simply unstoppable, although attitude limited his ability to match the levels produced by Rice over the course of his career. The wideout hit the ground running when he arrived in the NFL in 1998 and was part of the historic Minnesota Vikings offence of that campaign – one that should have gone all the way to the Super Bowl and won the Vince Lombardi trophy. No player has scored more touchdowns as a rookie than Moss did in the 1998 term when he notched 17. That would be the theme of his career at the Vikings, putting up six-straight seasons of 1,000 yards along with five terms of double-digit touchdowns. He appeared on pace to match Rice’s accomplishments, although his career was derailed by a three-year spell when he lost his form and became disenchanted. His trade to the Raiders proved to be a disaster for both parties as his attitude and displays on the pitch were a huge issue for the team. As a result, he was traded to the New England Patriots, where he took his game to the next level in the 2007 season, breaking Rice’s touchdown record notching 23, with Tom Brady throwing 50 strikes in the campaign. Moss and the Patriots almost became the first team to go 19-0 with the wideout scoring a late strike in Super Bowl 42, but it was in vain as the New York Giants staged a late comeback. His career in New England tailed off due to an injury to Brady before Moss’ old ways returned, marking the end of his time in the NFL before his retirement in 2012. He was electric and had outstanding numbers, notching 156 touchdowns, 15,982 yards and 982 receptions, but he lacked the team success and longevity of Rice. 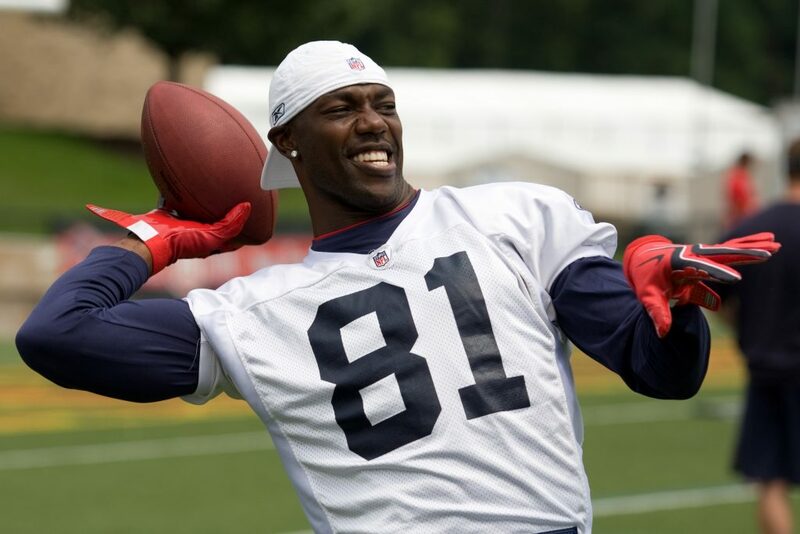 Terrell Owens was a similar maverick character to Moss. Brown and Jones could be on course to match the best of the rest should they continue their current trajectory. Terrell Owens was a similar maverick character to Moss and he was extremely impressive but was not quite as explosive as his contemporary. Larry Fitzgerald is an outstanding player with an impeccable character on and off the field. At his best, he could match the destructive play of Rice and Moss. However, he has been limited by a number of poor quarterbacks during his time with the Arizona Cardinals. He is currently fourth on the all-time list – imagine if he had played with quarterbacks of the ilk of Brady and Montana. Both Brown and Jones are in the 9,000-yard range at the moment. At the least, they would need another 5,000 yards to break into the top ten in terms of yardage. In recent history, names such as Andre Johnson, Reggie Wayne and Steve Smith Sr are in their class. However, Brown and Jones have proven they have greater quality, especially in key moments. Both players have yet to win a Super Bowl, which could make the difference in consideration. They’ve both been on the losing side in the title game, although Jones almost had a signature moment in Super Bowl LI in the Falcons’ defeat. Longevity and success will determine how Brown and Jones are remembered in terms of their greatness, although they’re on the right path.